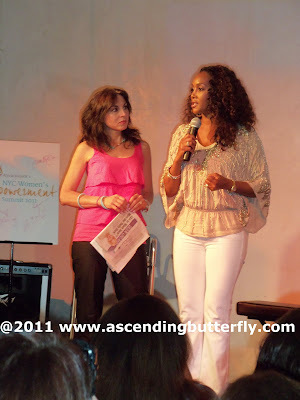 Ascending Butterfly: NYC Women's Empowerment Summit 2011 Recap! 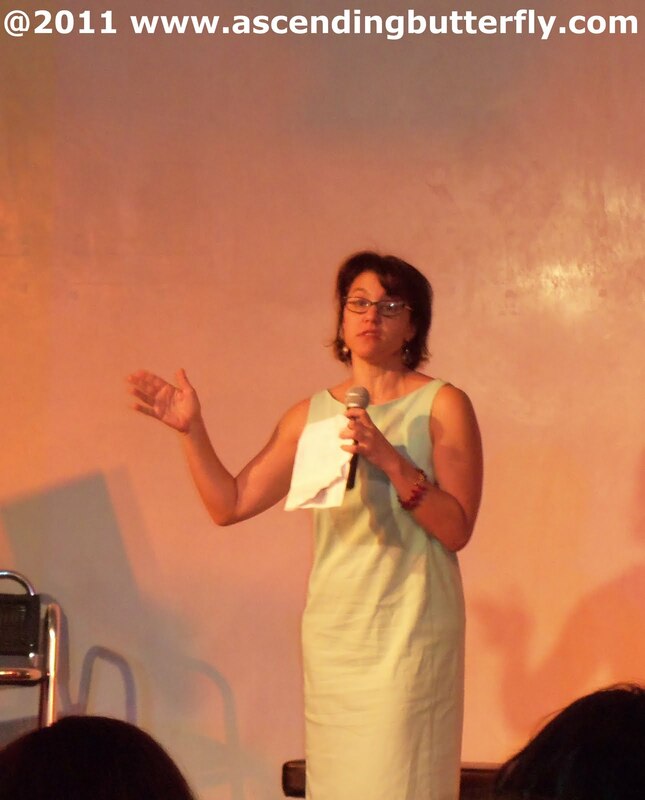 As you know on Saturday I attended the NYC Women's Empowerment Summit, which I wrote a preview about HERE. I also wanted to share a recap of the actual event! 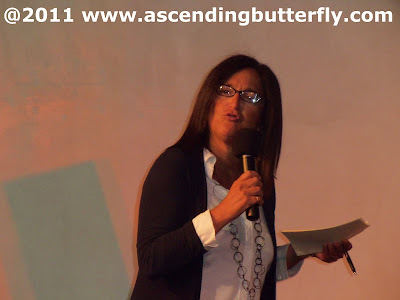 Ascending Butterfly began because I wanted to seek out and share the best of inspiration I found both on and offline (and yes my love of butterflies and all that they symbolize in my life). 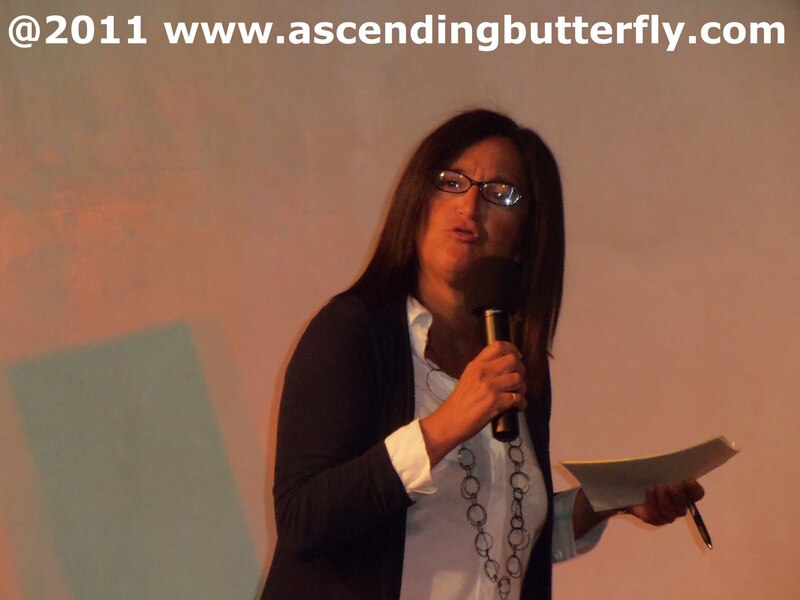 I began sharing daily breathing affirmational excercises, and they seemed to really resonate with readers of all ages, sexes and religions, which is why as soon as I heard about this event, I knew it was perfectly in line with what being an 'Ascending Butterfly' means to me! A very well chosen group of Women who have achieved success in their respective fields took time out of their very busy schedules to come together and share how they got to where they are, how they've STAYED there, the bumps along the way and what they've learned. 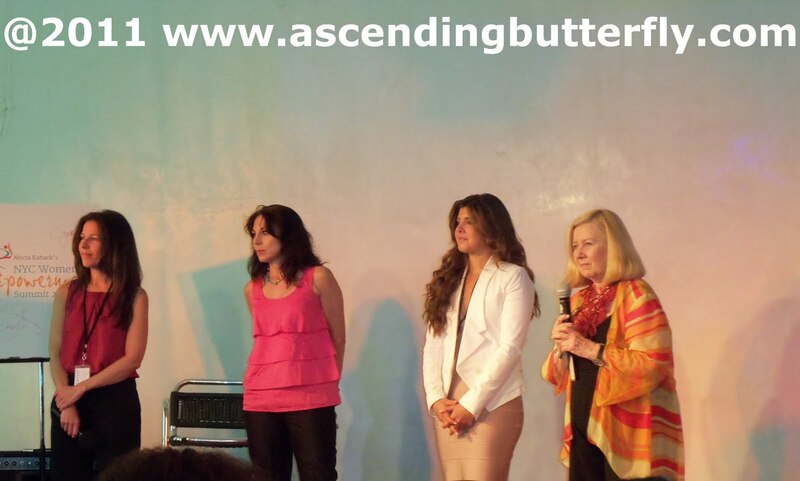 They shared inspirations that empowered them, so in turn they could help empower us! I left the event energized, it was a great reminder how important it is, particularly as women to enable and empower one another. And the fact that the proceeds of the event went to the Make A Wish Foundation made it even that much sweeter! "If you don't know where to go, stand still. Be Tenacious. Be Brave. 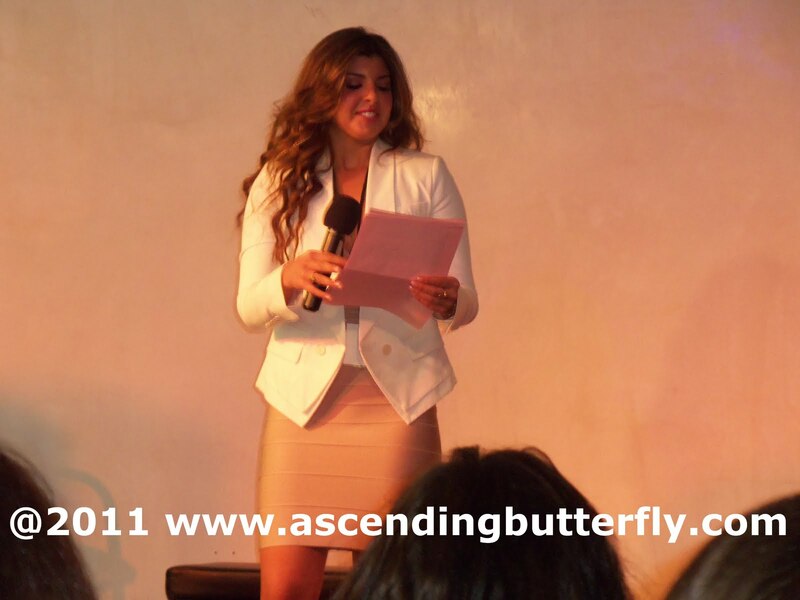 Be Fearless"
- She proved this by blind pitching a story to the Business Editor of the New York Times. And when you read her full bio, you'll see the rest is history! How many times in your life have you found that the only way to truly move forward was by standing still? Doing just that has helped me at every single cross road in my life. It's an important reminder, just how much moments of stillness actually serve to help us! 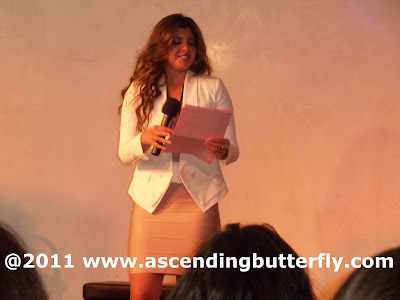 I personally couldn't agree more, I prefer to only feature celebrities on Ascending Butterfly who are doing something to give back, it was very empowering to see my sentiments affirmed by a successful journalist! Yes that's right, her words of empowerment were super simple, but probably the most profound! She began with an excercise asking us all to stand up. Then she began asking questions where if you couldn't answer them with a yes, you were asked to sit down, at the end of her questions only FOUR, yes four women in that room were left standing. How could it be possible that in a room full of dynamic, fearless women that only four were left standing. That only four weren't letting excuses hold them back and they were in the places they were meant to be and doing just what they were meant to be doing, and leading fulfilled lives. Say WHAT? Certainly I am fulfilled right? And now you ask, where does the 'So What!' come in? The So What, was symbolic of our excuses. The negative self talk we give ourselves to justify NOT moving forward. I realized that I have a few 'So Whats' to move past myself so I can in fact move forward. 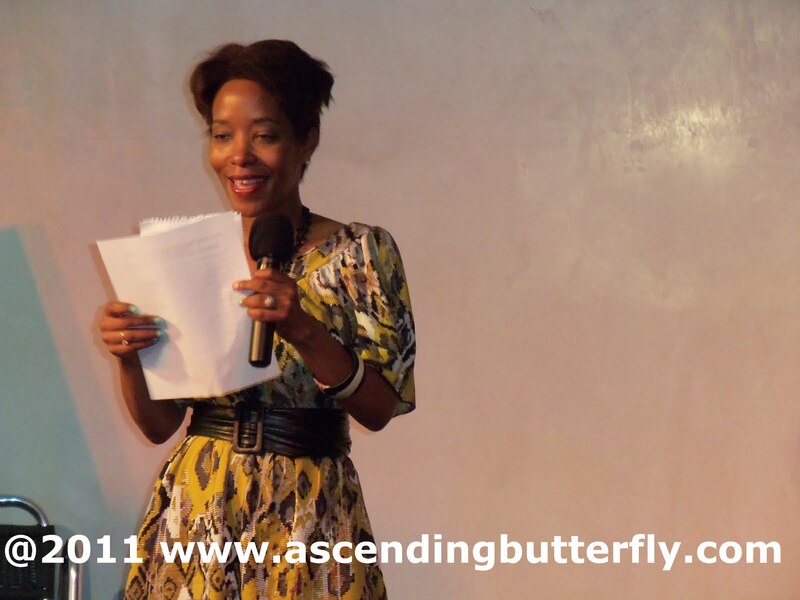 I can tell you ladies that Abiola is empowerment personified! 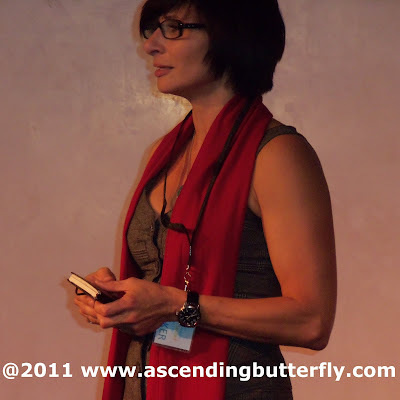 And I'd love to connect with her and see if we can make her upcoming book, The Passionista Playbook for Rockstar Living, an upcoming Ascending Butterfly Monthly Book Club Pick! "Charity is my drug of choice"
While the theme of giving back in some way was a big theme with most of the speakers, Chelsea's passion for giving back definitely did shine through! Please be sure to take time to read her bio on the Empowerment Summit's main site to see her amazing body of work! 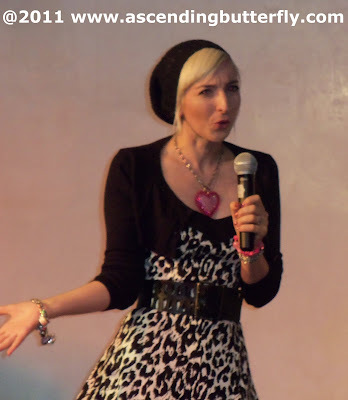 Chelsea started out in radio at the age of 16, became the youngest AM radio host when her show, Teen Talk Live with Chelsea Krost debuted on WBZT 1230 AM, establishing the tagline, “Our voice. Our opinions. Our time to talk.” her goal is to be the voice of our generation, 'the millenials'. 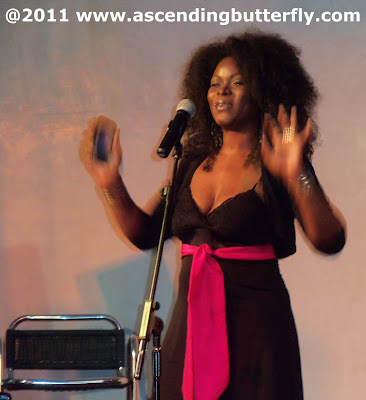 She is currently working on a television pilot, “Positively Ernie” featuring Ernie Anastos, the Emmy Award-winning New York City Fox News anchor. "You can achieve your goals with dedication, persistence, and a good support system"
"Really Find Time For Your Passion"
"Transition from 'Asking' to 'Telling' people what you want"
Fran began her professional career at the age of 14 as a dancer. In the 90's she co-founded, Manhattan Theatre Source, a theater and arts service organization still in operation in Greenwich Village that rarely has a dark night. Her new play, Magic Bird tells the story of the rivalry and friendship between Earvin "Magic" Johnson and Larry Bird and is being crafted based on conversations with the two Hall of Fame players. Seating for this special and unique event is limited to only 100 tickets available to the public, all Proceeds from the event go towards The Make A Wish Foundation. I loved the reminder that no one knows what you want better than YOU, you must use your voice, you must tell people what you want, and don't expect them to guess! What are you passionate about? Are you giving that passion the time and energy it deserves? After the morning session of speakers, there was a brief Q & A where the speakers answered questions from the audience and also shared wisdom given to them by others! What are the best words of wisdom you've ever received? Who did they come from? A lot of women in the audience seemed to relate to Gala, from her description of her beginings working in the New Zealand Post Office, to her takes on her life and life at large, Gala has an enthusiasm that's definitely very infectious! "Take Yourself Out on Dates So You Can Get Comfortable With Yourself And Your Own Company"
And she did not mean those times where friends or a date bailed and you stayed at the movie or restaurant, it's meant for you to do this on purpose. And trust me, it's a very empowering excercise. I've done this one already, but I'm long overdue for another 'date' and may just have to do this one again sometime soon. Not only is it empowering, its an incredible reminder of learning what YOU like and don't like. I'm sure you know just what movie, restaurant, etc that your BFF or DH would like, but what about what YOU like? Gala believes in pink lingerie, sequins, stardust & candy-coloured Cadillacs. She believes in making mischief & the triumph of magic over the brute. She believes in short skirts & lip gloss & bringing about the radical self love revolution. She believes life doesn’t have to be serious, that you create your own reality & that beauty is all around us. <-while this is from her bio, I thought it was so fab I had to share it here! Her Things I Love Thursday lists, and her Radical Self Love Bible (where she places good things/compliments paid to her) were my favorite take aways from her very empowered talk! "Your Instincts Will Tell You Who To Trust"
She started a folder called "Reclaiming My Purpose" and much like Gala's Self Love Bible, she refers to it when she's told 'No' or that she 'can't'. I love both ideas, a place where you place all the good things about you, your triumphs, successes, moments of joy, a scrapbook of success! My gratitude journal does the same for me, I placed a folder in all of mine that contains stubs, copies of special photos if the gratitude post was regarding an event or moment and I love referring back to mine. "Be Yourself, But Take the Council of Others"
"Be Fearless, But NOT Reckless"
"Study, And Associate Yourself With Successful People"
"Always Challenge Yourself, And Push Yourself Further"
While I don't see it anywhere in her bio, her delivery was part stand up comedienne and I truly think she's missing her calling and should give an open mic night a try one of these days. She's savvy, smart and successful, but all at once down to earth and approachable. She couldn't be more spot on about studying successful people, seeking out mentors in your life, and filling your life with the people who raise you up, be it mentally, spiritually or emotionally! 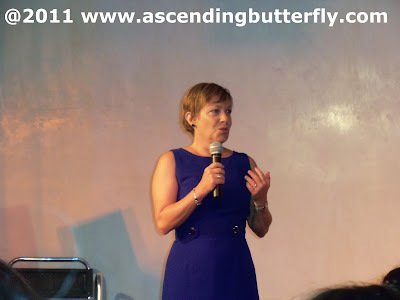 Oddly enough yesterday a friend of mine cleared out her facebook list of what she felt was 'dead weight', and it brought Judith's talk right back to me! Eliminate that which doesn't empower you from your life. You will be all the better for it! "You Won Because You Asked"
(3) Quantify It - How Much? How Many? How Often? and Why? (5) WHEN do you want it? This plan of attack is brilliant, and you can pretty much translate these steps to anything, fundraising, sales, bloggers and more can benefit from organizing and making a dedicated plan of attack. Thanks to her, I'm more motivated than ever to continue seeking out a sponsorship for the next Blogging Conference, Never Say NEVER! 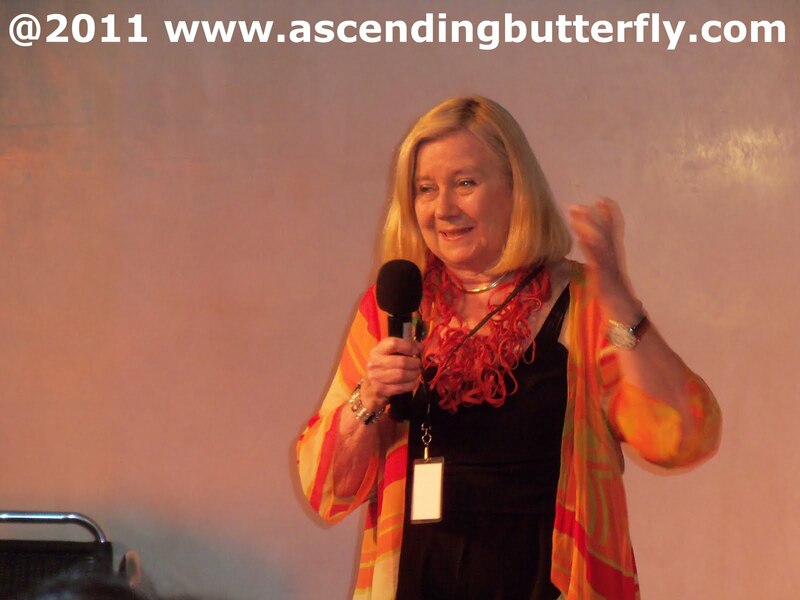 I also hope we can have her come back with her book 'The Ask' for our Ascending Butterfly Monthly Book Club! "You can't give well if you don't know how to receive" - Ladies, can I get AMEN? "It's not really change, it's transformation"
"Learn to Step Out of Your Own Way"- How true is that? Lubna started by telling us all that she 'is an Arab, with a grandma that's Jewish, raised in the Middle East.' Like most of our speakers, this wasn't her excuse, it was just another 'So What'! I found her reminder that the only way to give well was to allow yourself to fully receive incredibly empowering! Women for the most part have a hard time even receiving a compliment. Someone tells us 'nice outfit' we usually say 'this old thing'? Women need to remember to allow themselves to receive, permit themselves to prosper and certainly step out of our own way and stop being the roadblocks to our own success! 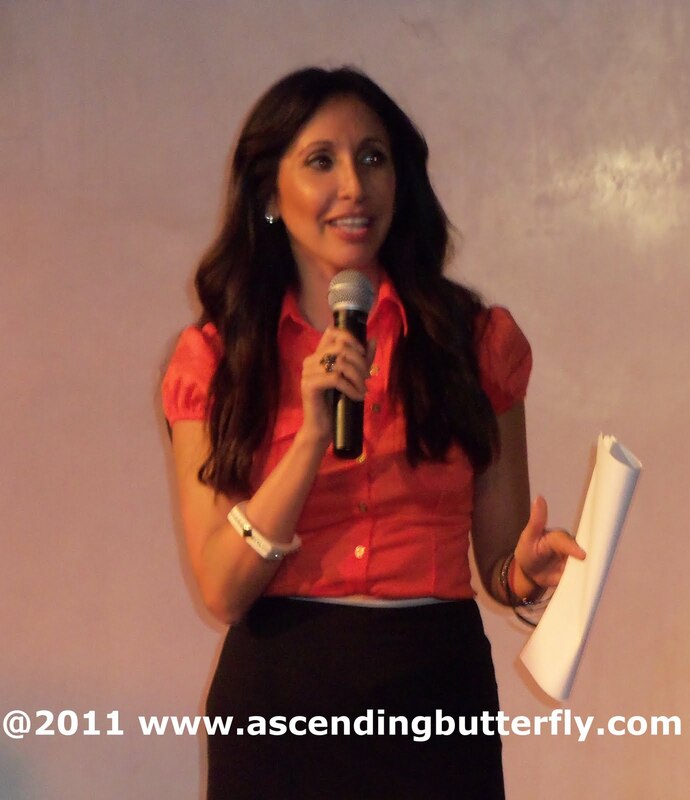 I would love to see if we could have Lubna return and share The Fresh Diet with Ascending Butterfly readers! Before becoming so heavily involved in theatre, Pat Addiss ran her own promotions company for 30 years called Pat Addiss Enterprises and then gave it to her daughter. She is now is one of the most prominent female producers in Theatre! If anyone on the roster could speak about Change, it was certainly Pat! "Embrace Change" - "If you start something and it's not going the way you want - CHANGE - don't be afraid to change." "I was born to connect people"
I could certainly relate to Pat, I've made a number of changes, some by force, other's by choice and like a Phoenix I keep rising and taking my career to different levels, I also naturally enjoy connecting people, and at first took it as a by product of my recruiting days, but it's something I still do quite naturally and really enjoy doing. And several stories and anecdotes Pat shared about her life and natural love of bringing people together truly resonated with me. Sibrena, lost her mom and then had to face the challenges of being a young mom herself, not her excuse, but again her 'So What', via loans she became a Media Buyer before she even knew what the title meant and a business was born! She has gone on to do way more than her original goal of providing for herself and her child, she was able to succeed and transition her career into so much more. I hope you are now feeling way more empowered to do the same! So I don't think I need to introduce the NAACP Image Award winner, Prism Award for Best Actress in a television series—drama, and one of People Magazine’s 50 most beautiful people Vivica A. Fox! (I was pretty psyched that she was seated pretty close to me before she took the stage! ) 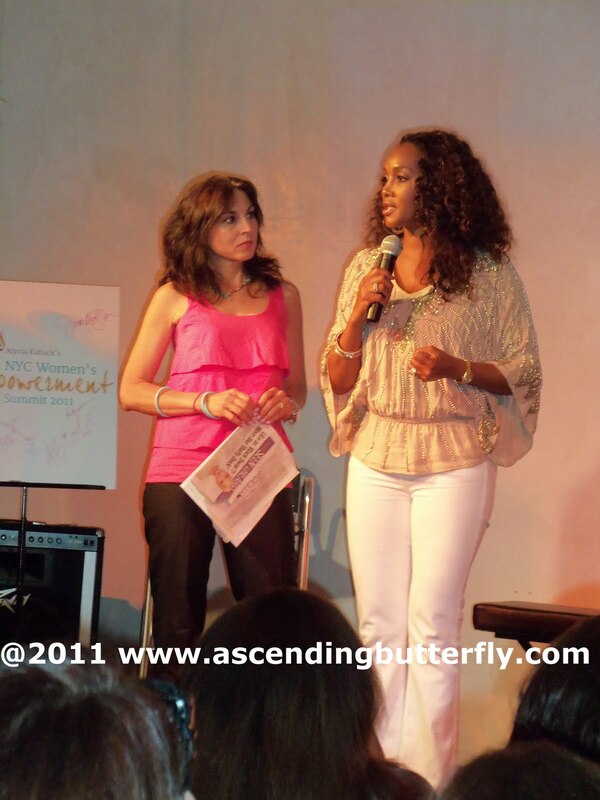 Vivica was as excited and empowered by the other speakers as we were! While you may know her as a legal powerhouse, Vikki is currently awaiting publication of two books, a work of fiction and movie entitled “Love, Lies and Litigation” a chick-lit legal thriller and non-fiction work entitled “The All-Star Divorce” in which she details her “divorce management” approach to as well as a self help guide detailing the experts needed to empower people before, during and after a divorce. Her current published book “Premarital Survival Guide” for those approaching marriage to stay in it for the long haul which is available on her website and on Amazon.com. She also has co-authored legal articles for NY Divorce Magazine and the New Jersey Law Journal, titled “How Can I Keep My Legal Fees Down During My Divorce?” and “Know Your Limits,” respectively. Charitable causes always have been an important aspect of Ziegler’s life. As a volunteer with Make a Wish Foundation – which grants wishes for terminally ill children – she ran the gift giving and charity events for the Passaic County Chapter for four years and met with families and helped plan wishes. She also volunteers at soup kitchens in New York City, collects for Toys for Tots each year, donates clothes for women in business, collects prom dresses and gowns for Catherine’s Closet, contributes to Chai Life Line – a Jewish organization that gives guidance to single mothers – and participates in food drives for the underprivileged with A Brand New Day every year. Her pro bono work with Partners for Women and Justice – an organization for indigent and battered women – continually exceeds her yearly requirement for New Jersey. While I thought I kept 'busy' even I wonder how she finds the time! "Keep Focused On What You Want Your Business and Your Customers To Look Like" - I agree, Visualization is an incrediby powerful tool. If you need help doing that create an attraction board and help that bring vision to life! 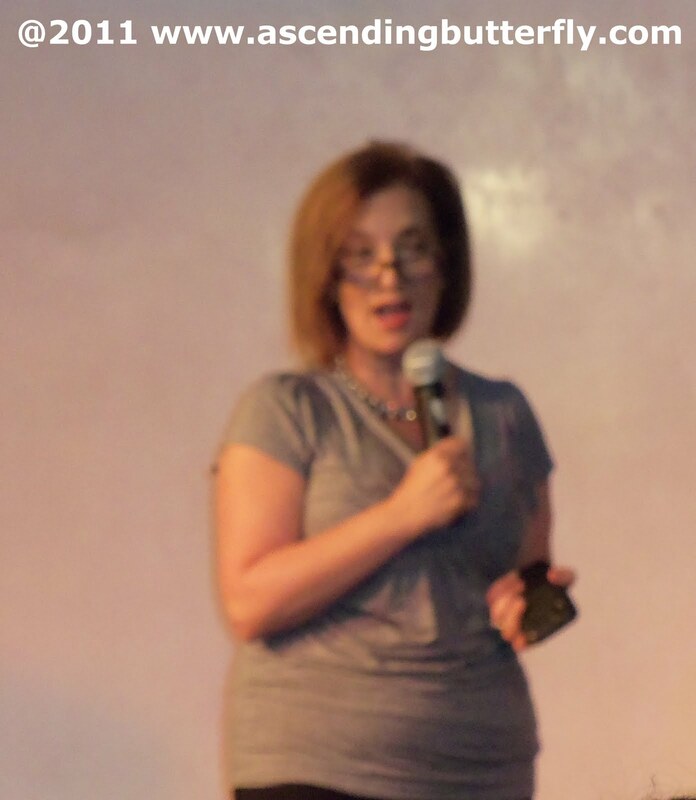 Wendi didn't let discouragements stop her, her own dad discouraged her from coming to NYC. Does it get more powerful than parental disapproval? Sometimes the people who love us most, are the same ones that can hold us back and deter us from our dreams, but as empowered women, we can't AND wont let them! One day at work Wendi suffered from what's known as 'Hysterical Paralysis' - I think you could hear a pin drop at that point, life can get THAT stressful that our body can only shut down to force us to stop. You do NOT want that to happen! 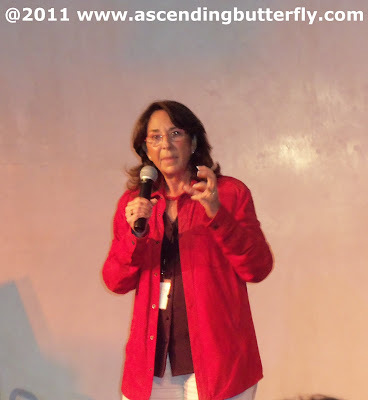 This caused an internal shift in her that forced her to make powerful changes in her life including opening the door to love and adopting a child. "Red Thread Theory" we are all connected. 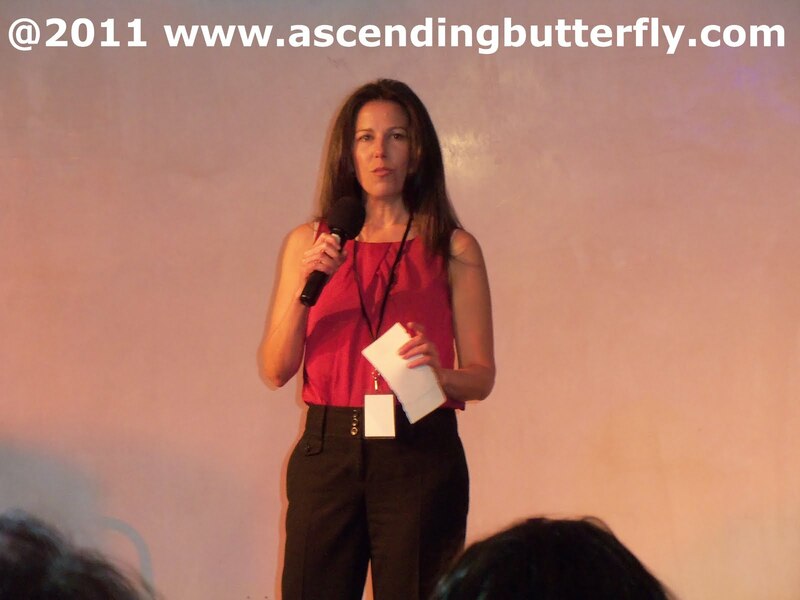 - We are all connected, and when we spend time actively finding ways to empower one another, we create an energy that transforms into power, and that power can do anything! While I couldn't take you all with me physically, I hope you now feel a bit like you were there in spirit. Go out and be empowered today! FTC Disclosure Info: This is NOT a sponsored Post, I attended the NYC Women's Empowerment Summit and was under no obligation to write about it. All experiences shared here are solely my own perspectives of the event. @Olivia - Mahalo for the visit today, I'm following you now as well and wish you success on your musical journey! The conference was amazing. 16 powerful women sharing how they got to, and importantly how they STAY where they are and sharing their secrets to success, can't think of a better way to spend a Saturday in the City! @tracy ty so much for your inspirational comments on my blog. your right that she was being rude.. things get taken out of context so easily - sarcasm and pointed behavior turns into rudeness all too quickly. it is very high school and i shouldve just ignored it, but its hard for me to. In any case, your comment made me feel much better and thank you for that! I swear it was only with the best intentions, but i just get heated when someone is rude to me! :/ LOL! Hopefully it wont happen in the future. Ill keep my hop posts short & sweet! No worries, I totally understood, it's human nature when we feel attacked or entirely misunderstood, or when our intentions are being mis-conscrued that we react! I'm glad I could leave you with enough inspiration that you want to put that experience with that person behind you and focus on the great bloggers participating in the Alexa Hop! @Abiola - Thank you! I do hope you will be there if the summit happens again this year, and that you will consider hosting a review and giveaway in our monthly book club of your book!